Your air conditioner is a sealed system like a tire on your car. Although a small air conditioner refrigerant leak may not pose a problem, a more serious air conditioner refrigerant leak will do so, and could occur at any time. Some refrigerant leaks are plainly visible to the eye. These include a visible line break, the presence of oil, and quite possibly a refrigerant vapor cloud of escaping gas. Inject dye that travels through the system and the refrigerant leak can be detected with a UV Light. Lengthens System Life – When refrigerant leaks out, oil that lubricates your compressor leaks with it. Not repairing that air conditioner refrigerant leak will dramatically shorten the life of your system. Lowers Utility Bill – Systems that operate with insufficient refrigerant will run longer to keep your home cool. 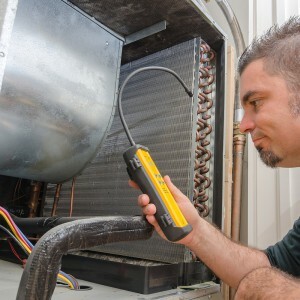 Often times the AC refrigerant leak repair cost is recouped in energy savings. Saves You Money – Refrigerant costs are increasing more rapidly than ever due to EPA regulations. Avoids Costly Damage to Home – Due to insufficient refrigerant, your system may “freeze up” and the water created during the thaw can overflow and damage floors, ceilings, and walls. Irreparable Compressor Damage – Acid and contamination will damage your compressor, causing premature failure. Take the first step to a long-lasting, energy-efficient air conditioner by calling us at 1-800-937-6736 to schedule refrigerant leak detection service with one of our experts.